This is a gastro pub,make no mistake that the food is the paramount concern,the service can be slow.The decor is much better than under the previous management and so is the garden which was used as a dog toilet and not frequently cleared up! On entering you would not expect a beer of excellent quality and you would be wrong! The beer is excellent ,a cider from Lilley's , London Pride and three revolving guest ales from South-East England breweries,triple FFF, Hop Back,Sambrooks, Surrey Hills,Dark Star etc. 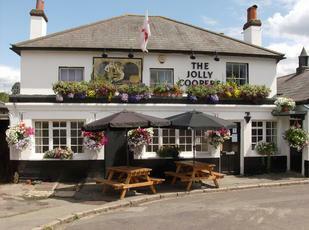 if you want a pub crawl the nearby Cricketers serves a range of beers Including those from Wimbledon Brewery. 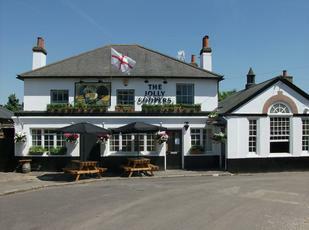 This pub re-opened on May 22nd after 6 months closed for refurbishment following a change of ownership. The pub has been opened by removing some walls making a larger lounge which leads into another room which is principally a dining area.The new bar takes up far less space than the old one but there are still 5 real ales on the bar but both the beers that I had were rather flat. As the pub had only just re-opened I have put it down to teething troubles. Food was very expensive but the decor is much improved. Reopened last weekend. Popped in the a lunchtime drink during the week. Lots of wrks done. Outside smartened up, old saloon and snug now bar and public is now dinning room, which is a bit formal and severe for my taste. Pleasant paved area at back. Small lunch menu, but did not try food. Other diners seemed satisfied. About 6 bitters, 3 of which were Fullers. Lots of Fullers brand around. All looking promising but called in for Sunday evening pint to find everything locked at that 2030hrs. So went to Cricketers. Would have gone to Weatherspoons in the first place if we had known. Think I will wait a few weeks before another visit. Maybe things will settle down. A much wider selection of real ales of late, Red Squirrel Brewery, Thornbridge, Triple fff etc have been on . Improvements in decor continue to be made in what i'd call the Saloon Bar. the beer quality has always been very god. Popped in yesterday, four ales advertised outside ,two actually on both mid-dark ales, on enquiring two more were quickly added both dark ales, as I prefer golden ales I departed to the Assembly Rooms where three golden ales were on at �1.99. I am always looking to support the independent pubs but they in turn have to think about the type of ales they offer. Pubs that charge �3.15 a pint as this one does have to go the extra mile to justify the premium pricing. My generous rating has now been adjusted to an average 5/10.